Mini Mash Lauter Tun at HomeBrewing.com for all grain home brewing. 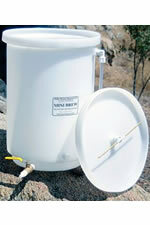 Take your all grain home brewing to the next level with the Mini Mash Lauter Tun. Sight Glass - This design perfection is to assist in balancing the vacuum created when hot liquor flows out.